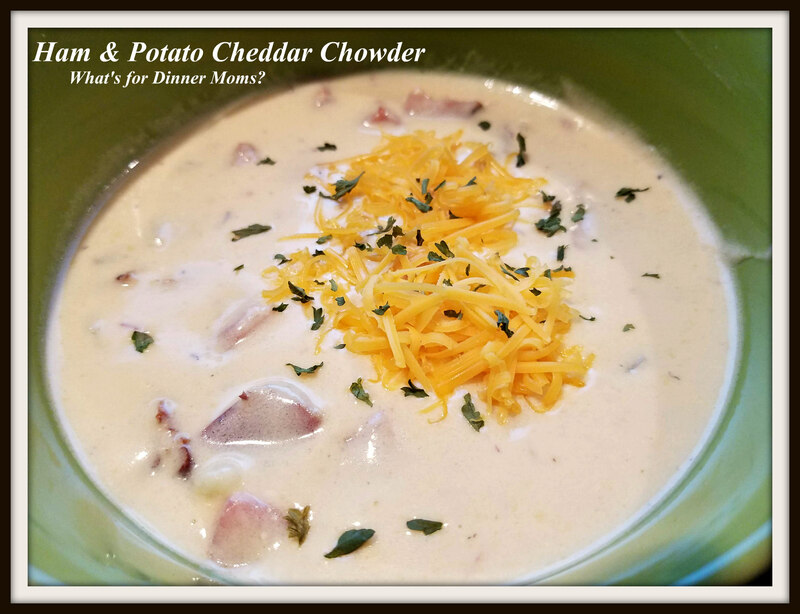 Ham & Potato Cheddar Chowder – What's for Dinner Moms? I love soup. It just warms me inside. If I have to pick a side I will choose a soup, especially a chowder or stew. I love the textures and flavor of just about any soup. Especially with warm bread and butter to dip in the bowl. Yummmm. We have a Zoup and Panera Bread nearby but I love homemade more than anything. It really isn’t hard to make soup. What takes time is the preparation of the potatoes, grating the cheese, and dicing the onion and ham. Once that is done this chowder is fairly easy to make. For my soup divided family this was a hit. It was warm and flavorful. We dipped garlic bread into the soup and it was so good! If you don’t have garlic bread a few garlic croutons sprinkled on top would be excellent also. Serve this with a nice green side salad to make a complete meal. A creamy and flavorful chowder to warm your insides. Melt 3 tablespoons of butter in a heavy large pot over medium-high heat. Add ham to the pot and cook until golden brown stirring frequently, about 5 minutes. Remove the ham from the pan. Add the remaining 3 tablespoons butter and melt. Add onions and saute until they are softened, about 3-4 minutes. Sprinkle flour over the onions and butter and stir until well blended. Cook 1 minute additional. Add chicken stock, milk and potatoes and bring to a slow boil then reduce to medium low heat and simmer for 15 minutes. The mixture will thicken some. Add sour cream and cheese and use an immersion blender or blender on the soup until it’s blended to your desired texture. We like to leave some chunks. Add the ham back into the soup. Serve topped with extra cheese and green onions as desired. Gosh, this sounds so good. This sounds like a soup I will love!! Thank you for sharing, Marci!